Hi friends! After a few days of being really sick i finally feel good enough to stare at the computer again and share this DIY. Somewhat recently my camera bag was stolen (luckily JUST the bag, not my camera) and I was bummed since I would have to re-buy but I also saw it as an opportunity to get a better (read: cuter) one. I often would not bring my camera places because I didn't want to carry around a camera bag with my purse and whatever else.. Either that or wrap egg crate or scarfs around my camera and stuff it in my purse. Neither were cutting it for me. I looked online and i found some good non-traditional camera bags that look like purses, but all of them were well over $100 and up to $300.. (if you put all the purses i've ever bought in my life together it still wouldn't come close to that total). Procrastination eventually lead to an idea in the back of my head of just making one myself. And after christmas I found the ideal shape/size purse at target on clearance. I got the rest of the supplies at joann fabric and made it in a night, while watching the beauty and the beast blu-ray. This purse probably wouldnt have been my first choice if I were just picking it out as a purse, but it looks a million times better than any plain camera bag so i'm very pleased! And it all cost less than $20. Here we go, I'll try to explain this the best i can..
a purse/bag - i wanted something very specific..ie: just tall enough for a DSLR, just wide enough for the camera to sit flat, a tapered top so its easy to carry, zipper closure, room to fit other lenses and camera equipment and also room for a small wallet and other everyday things. 1/2 inch foam - 1/4 - 1/3 yard, depending on how many inserts you want. 1 yard of fabric to cover foam - you might not need a whole yard, but i wanted to make a whole bunch of extra inserts just in case some get lost. I measured the inside of my bag, and decided i wanted foam on all sides (bottom, both long sides and both short sides). These are the measurements i used for my foam, yours will probably be different but overall it should be around the same size. Now, use all these foam pieces as a pattern for the fabric, adding about an inch to all sides for seam allowance. Cut two pieces of fabric for each foam insert (obviously!).. Note: For the lens divider, add 2 inches to the short ends so you have little flaps to sew velcro onto. Decide where you want your velcro and cut to size and sew onto right side of fabric. Now, sew three sides of the fabric, and stick the foam in, making a pillowcase type thing for the foam, then fold in and pin the opening closed and sew shut. When you are done sewing all your pieces together use velcro glue to put velcro on the inside and bottom of the purse to keep your main foam pieces in place. Add your dividers and you're set. If you have ANY experience sewing you can definitely do this, and even you don't, i bet you could. I just made it up as i went along and made it work and it turned out extremely well! wow great job! 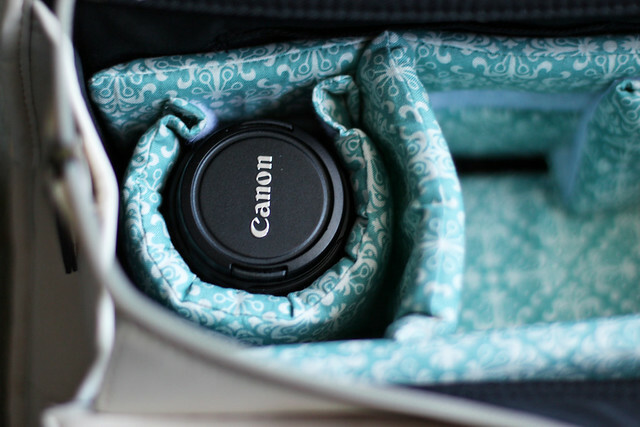 such a good idea to turn a cute purse into camera bag! thank you so much for posting this! I hope to make it as soon as possible! this is the best project i have seen yet! thanks for sharing! now to find a perfect bag!!! This is amazing! I do the wrap a scarf around my camera all the time. I hate having to carry my camera bag everywhere I go if I just want my purse and my camera. I love this idea! I'm going to TRY and make this - I'm not that good at sewing...but I will try Velcro and glue. Maybe....you could do a contest sometime and a purse/camera bag could be the prize. Brilliant - just perfectly brilliant! I am so incredibly impressed with this. I just recently was gifted one of those expensive camera bags that look like purses and I love it. Honestly this looks just as sturdy and well made as the bag I received. Great job! This is a great idea and not very hard and just think stores are charging anywhere from $100 to $300 for practically the same thing I don't have a good camera yet but when I do, I'll be trying this out, also I have a small laptop that I hate carrying around so I'll also get a purse big enough for an insert for that also, excellent idea! I'm sorry to hear about your stolen bag, and I'm so happy to hear they didn't take the camera. This is really cool, I wish I knew how to make handy stuff like this! I really enjoy your site, no clutter, great photos, and tips! You're a genius! Thank you so much for posting this, I was going through different blogs and spotted your post! 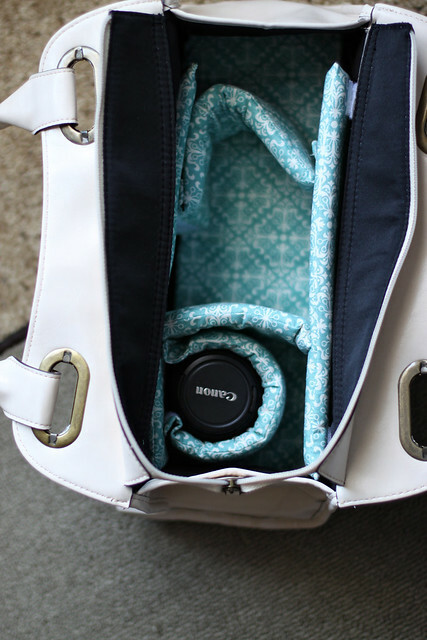 I have been trying to find a new camera bag that doesn't actually look like a camera bag..I can't wait to try this out. This is such an awesome DIY! I normally just throw my DSLR in my purse wrapped up in a towel! Hi! I came over from Elegant Musings and I just LOVE this. Hope you don't mind that I linked to it on my blog! What a great idea! I am definitely going to have to make one of these. Thanks for sharing! Fabulous bag! I was also on the hunt to find a bag and ended up just making my own. I used serveral sites for inspiration - including yours! I gave you a shout out :) Thanks for the idea! I had been thinking about making something like this for awhile!! I love it!! Thanks for your measurements and such!! Hi! New follower here, came via a post from Pink Ink... Love your post and the idea! 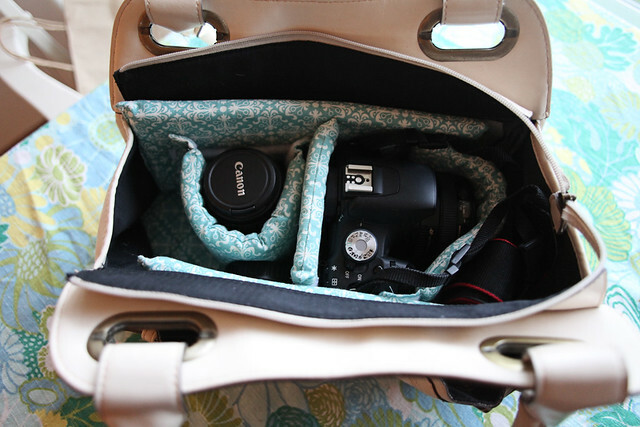 I've been wondering how to do my own bag since its so much simpler than ordering a $200+ camera bag! THANKS!!! Thank you so much! I have been trying to come up with a way to do this but I'm one of those people who needs to see it to duplicate it, so thank you. Wonderfully done and now I cannot wait to create my very own. So cool! Love this idea. you should sell the inserts... I'd purchase them... um do you want to make one for me & I'll buy it from you! this is such a great idea. I have been wanting a cool camera bag for an age, but as you say, they're so expensive. I am def going to try this when I have some of my other projects out of the way - I have just the bag to convert too! did you bought this bag or made it by self? Why didn't I think of this?! I'll be keeping my eyes out for a new bag now!!! Ooooo, maybe I'll just convert one of my vera bradley bags!!! I have been desperate for a bag like this and never even considered making it myself - even though I did make my own shootsac. Thank you so much for posting this, it is definitely on my "to-do" list!! glad i found this, i have this plan with a vintage bag i bought recently. hoping to turn it into a laptop or camera friendly bag so it needs some padding and dividers. thanks for sharing. 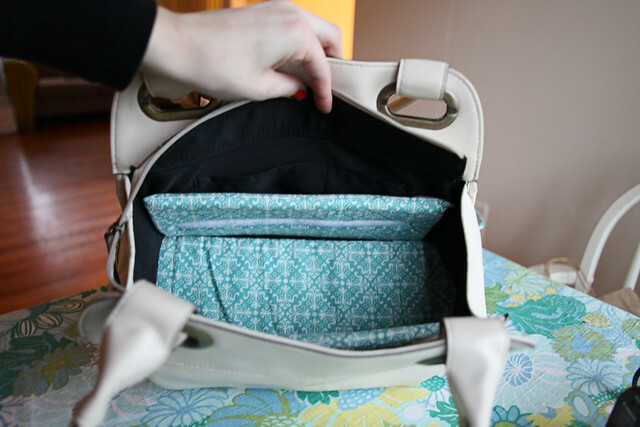 just found you via Grosgrain and I am so excited that you created this tutorial. I have been trying to figure out how to 'convert' my bag just like this. Thank you! I have been doing the camera-in-scarf trick and I actually have one of those camera sleeves, but it's really hard to get it in and out of the sleeve fast, not to mention the sleeve doesn't help with storing lenses. I'm also really hesitant to use my camera bag because it's branded all over, and it's not exactly safe for a lady to carry something like that round these parts. I've been dying to find something like this! I totally had this idea too! I was going to take the inserts from my camera bag and put them in a purse (by attaching velcro to the insides of the purse). Sewing your own was a great idea. I just don't think I could do it. So cute! I'm going to do this! I have a purse that would be perfect -- I actually bought it so I would have a purse big enough for my camera and all my stuff, but the sides are so floppy that I actually went 3 days thinking I'd lost my 50mm lens when it was really just stuck down in a corner under the lining. I could easily take out the center part of that purse and make this. Thanks for the tut! Thanks - we just posted our own creation and link back to this page with your thorough explanation and photos! You're the hero of a lot of 'togs right now of any level/skill. I've been eyeing those expensive bags for months but couldn't justify the cost. This is an awesome tutorial that I can't wait to try myself! I shared this link with my 'tog-friends in a FB group and they loved it and some had already tried it! Yes! Thanks for the idea! Hi! I found a photo of your bag on pinterest! Really smart! Turned out beautifully. Shared in on facebook too, hope you don't mind. I definitely need to try making one of these. I too do the same thing, wrapping and carrying in a purse. Thanks for the idea and directions! Such a great idea! This is now added to my to-do list. 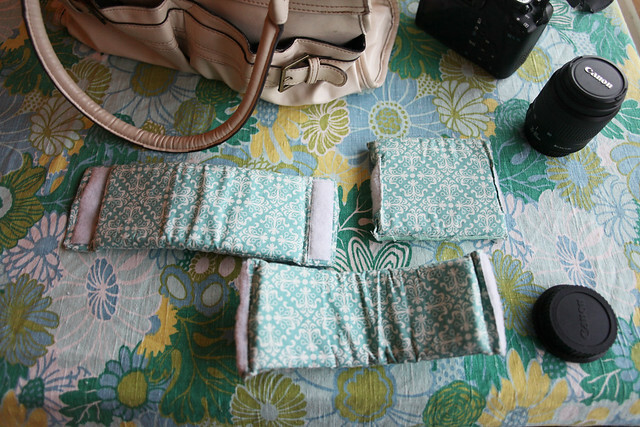 Along with making my best friend and I new camera strap covers. I might even match my cover to the fabric for my bag. Thanks for being so creative & sharing this with us. P.S. We have the same camera! I'm obsessed with mine! Love love love this inspiration! Thank you for sharing such a great tut! The bag is super super cute! Thank you so much for this great idea! I have a big backpack camera bag which is great for long trips but I want a purse/camera bag that I can use every day and still look nice and that it doesn't look like a camera bag! This is so cool! I tried it, and mine didn't turn out as well as yours, but it will do the job for now. I'll probably redo it, because I only made enough foam pieces to take just the camera and the lens for now so that I can trek around Las Vegas with it. Thanks for the idea and the tutorial! Hey..your blog is very amazing, I love to visit everyday.. I really need to do this, thanks for the inspiration! Brilliant! I have been leaving my camera at home too often because I've it's too hard to fit it into my purse, and I really can't carry the purse and the bag when I have my kids with me--too much! But this idea solves it. Wow. Thanks so much for sharing! Love your idea! So amazing how many of us carry our cameras in a purse. I've always just stuck mine in a purse without any protection and worried about it, but your idea is wonderful! thank you for sharing! Thanks for the inspiration! I found your DIY on Pintrest and just loved your idea. 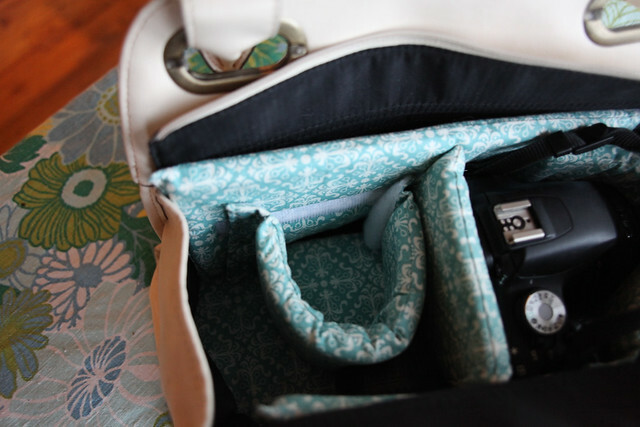 I posted my new camera purse on my blog also linking back to your page. Thanks again for the awesome idea!! Hey, there! I'm working on this now, and I love how yours turned out! I'll be posting the results on my blog. :o) I'm not very good at sewing, but since this involved mostly straight lines, I decided to give it a shot. I can't wait to try this! Same reason as everyone else, I usually end up HOPING my keys won't scratch my camera, or leaving it at home! This is adorable and SO useful!! I will definitely be trying this in the future! I just have to find the right bag and this is happening!! 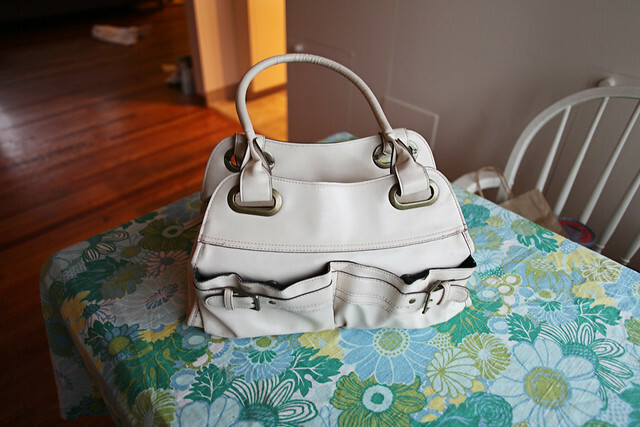 I shop goodwill and value village all the time where they always have a large selection of designer handbags. you could probably do it for less than $10 if you got one from there. Regardless, $20 for ANY camera bag is a steal, especially for one like this one! thanks so much for sharing the fortune that came out of your misfortune. sometimes the best things are birthed that way. I've been thinking about doing this but was a little intimidated. I'm so glad to find your post because it's given me the courage to give it a shot. Thanks! I recently shared your article, through the Facebook page of my blog, to all girls and women who daily follow my photography blog. If you think in the future to publish something new, dedicated to women, and always inherent to photography, let me know, I'll be happy to share it with all of them. The hubs actually just spotted this.. i'm def going to make one! One question... where did you find your bag? 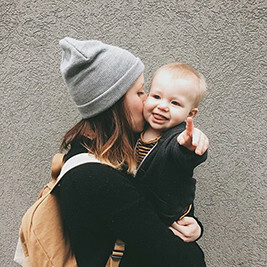 It's adorable and i'd love to find something of similar shape/color/size! I'm sure I won't get the exact one... but I will be on the hunt to try! :) Thanks again for sharing, this is such a fantastic idea!! Awesome idea! i just bought a camera bag, but its so DULL, black and ho-hum. I'm definitely going to give this a whirl. Thanks. This is awesome! I've been packing my new macbook air in my bag with towels for padding. I'm making one of these for my bag! Cute! 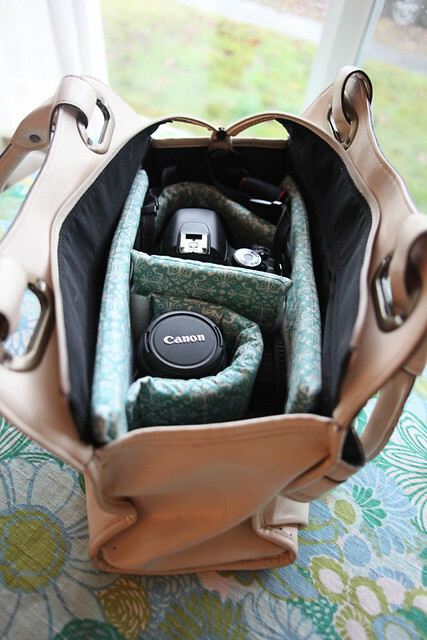 I have the same purse that I made a camera insert for! Too funny! There are some unique ideas and concerns being posted here in this website and this could be one good chance for me to be able to learn on how unique the responses of people over some rather uncommon concerns and problems. So creative, I love this! Thanks for the tutorial:) I featured a link to this on my blog. Hope you don't mind! Oh I so need to do this.. I was about to spend big bucks on a nice camera bag since I'm so sick of my ugly one.. Now I don't have to. Ooh yes! I love this! And I have the perfect purse too. I would love to link to your tutorial if you didn't mind. The particular information and facts I actually obtained in this website is a suitable confirmation that it's nowadays attainable to educate everyone and be abreast of latest information. This is great! I'm in love with Kelly Moore's collection and the Jo Totes collection, but I'm in the same boat...they're SO expensive and I don't know that I could justify spending that! I'm curious...now that you've been using this for a little while, how's it working out for you? The component accumulation and facts I actually obtained in this website is a eligible check that it's today getable to school everyone and be abreast of newest collection. Do you happen to know the dimensions of the bag or a bag similar? I've been looking for something like this forever and I would love to find a similar bag to use. made my own purse into a camera bag today, thank you! This idea is amazing! You are so creative! Found you via Pinterest. This is so clever! Just what I want! As everybody else has said, thank you for showing us how to do this. You are a star! I love love love this! Photography can be super expensive. I love this thrifty DIY idea. Thank you so much for sharing it. I am currently transitioning from a small "overpriced" purse like camera bag to a larger one so more of my camera gear will fit. This is definitely worth trying! Thanks again! I do not carry a purse and when I buy one it is only to carry camera gear. People laugh but I love it. Awesome idea. I am going to make one. Never really thought about it. Thank you for sharing this wonderful idea. You have just saved my life! haha, I've been wanting a purse camera bag and have been saving up for one that was about $150. NO MORE! Making this (most likely this weekend!) Thx!!! I found this blog a few months bag and have made a few of these using yhour brilliant idea. Lately I've been jonesing for a pretty new Kelly Moore camera bag, but 250 is well outside my family budget, so today I whipped one up for a great (big) bag I already own. One change I make is the velcro. I use a 2 inch wide velcro. IMO, the more the better. I like 2 stripes, side by side (esp if I'm doing this for myself b/c sometimes some dividers are shorter than others ;) ) The other thing I add is velcro at the bottom of the insert and therefore the dividers. All the extra velcro makes the whole thing feel more stable when you put the dividers in. you could/should make these inserts and sell them on Etsy for all us camera lovers who don't sew and are too lazy to sew. I would pay $15 buck for a set of inserts! that would be awesome!!!! Hi! I was wondering what kind of foam you used. I can't seem to find it anywhere...Thanks! Good post. It is really help to us. Its give us lots of interest and pleasure. Its opportunity are so fantastic and working style so speedy. Its really a good article. It gives me lots of pleasure and interest. What bag did you purchase? I went searching for one the other day and I can't find anything I really like. I found a few contenders but they weren't big enough or they didn't have a wide enough opening to easily access the camera. Any info on the bag would be much appreciated. Thank you for an amazing post. Thanks! This is awesome! I just purchased a camera online today & it should arrive Tuesday. I didn't purchase a bag because they are so expensive & scream, "hello, I'm an ugly camera bag"! I was going to wait to see if I could figure something else out. This is perfection . . . I am fairly new to sewing so I hope I can do it. It doesn't seem too difficult, but things aren't always as they appear . . . haha! Thanks again! This really looks great, I´ll make it!! Did you make the leather part on your own? Thanks for such a great idea! I'll try this! This might be an old post but i really want to make my own! Where did you get that foam? I was looking at Joannas website and i cant tell which one is the right one. Would a 1" foam work at all? Or would a 2"? I wasnt sure. Hello! I got the foam at joann fabric. personally i think 1" foam or 2" foam would be too thick.. but thats totally up to you! it would work but it'd be bulky! Not all foams are created equal and some can be downright dangerous (to the camera) . The ordinary foam that they sell at the sewing store is great for seat cushions but not the best choice for camera bags. It’s too soft and compresses too easy to protect against a hard blow with a sharp hard object. That type of foam deteriorates rapidly and can vent gases that can be harmful to camera lenses. It also gives off a fine dust that can work through fabric… and it’s sticky dust! Get that dust on your camera sensor and it’ll take a trip to the repair shop to get it off. The foam dividers in my Tamrac camera back are much firmer, so I was looking for something like that. Then I found a sheet of packing material that has the same firmness and stiffness as the camera bag dividers. It’s stiffer than the common rubbery foam, so it creates a more rigid structure that retains its shape. It’s also a lot more firm; it does not compress easy and can protect against a sharp blow with a hard object. The material does not vent any harmful gases or create dust. And it does not break down over time the way cushion foam does. Its actually lighter than regular foam. In appearance the surface is slightly shiny with a bumpy orange peal texture. It feels smooth and slippery between the fingers. It cuts easily with a knife and because it does not compress it’s easy to cut into precise shapes and sizes. The problem is finding it. You cannot get it at craft stores or even the big packing supply companies like Uline do not carry it. I found industrial suppliers that carry it but they only sell it in large packs of sheets for several hundred dollars. Then I found a sleeping bag matte at Walmart for about $8, made of the material I was looking for. 3x6 ft in size so you can line quite a few bags. 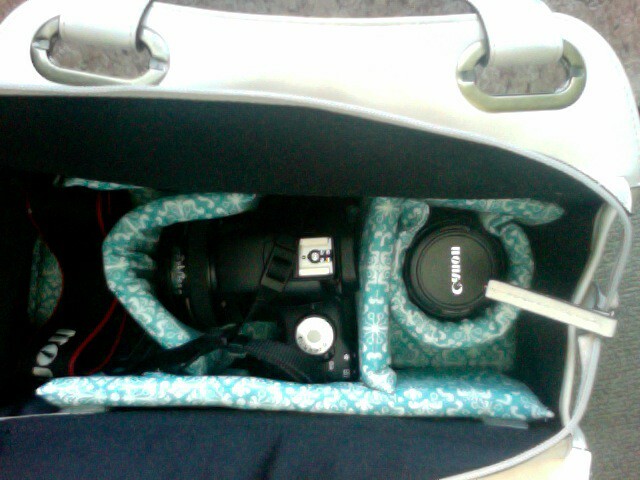 A I made lining and dividers for two handbags and converted a cheap backpack into a camera backpack. This type of foam is far superior to the type you find at the craft stores. Now that I’ve found this, I’ll never buy another camera bag. Fabulous tutorial! I discovered it via Pinterest :)! I am not an avid sewer and was able create the inserts for my bag!! I've been seeing fabulous bags turned into camera bags all over the place, but sadly, do not enjoy their price tag. This allowed me to create my own! Thank you, thank you!! 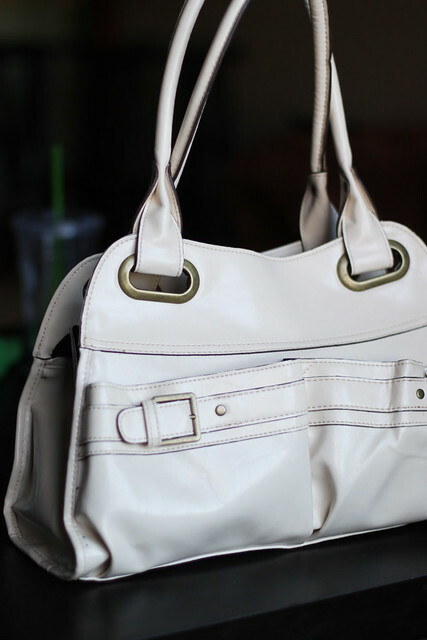 Would you be willing to sell this purse and all? I'm definitely going to try this. It looks like it will accommodate my camera, as well as "life's little necessities" (e.g. wallet, phone, makeup, etc.). Very cool!